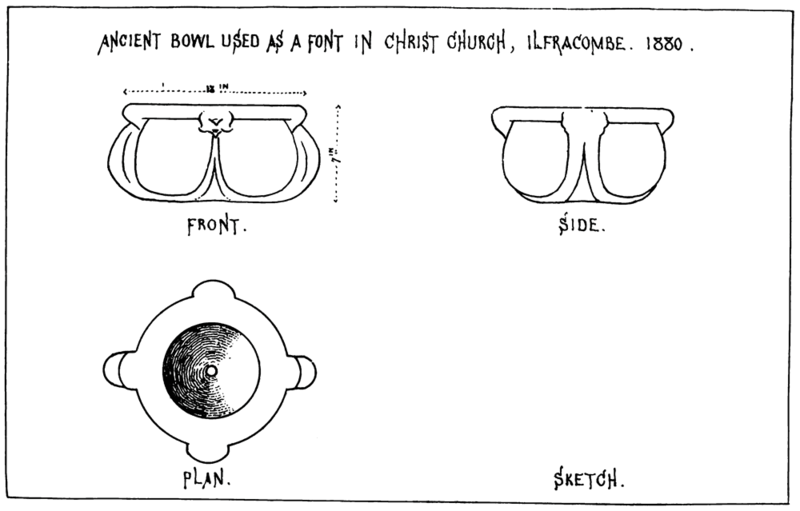 When the Devonshire Association met in Ilfracombe last year (1879), they were informed, at one of their meetings, that among the objects of interest in the neighbourhood was an ancient stone basin used as a font in Christ Church, Ilfracombe. Many of the members paid a visit to inspect it, and expressed great interest in the ancient relic. It has been suggested that some account of it would be acceptable. It is to be regretted that so little of its history can be traced. It was placed in the church by Mr. Thorne, the old gentleman who built the church in 1844. It stood on a cumbersome wooden pedestal, with a conical-shaped cover, which completely concealed it from view. Thus hidden, it excited for many years neither comment nor curiosity. When the church was enlarged, the architect, Mr. Gould, of Barnstaple, directed attention to its value, and gave it as his opinion it was an ancient Piscina, at least 600 years old. Since then others have been to see it; and one authority declared it was more likely to have belonged to the days of Imperial Rome, and have been used for grinding corn. This idea has been somewhat confirmed by seeing in the Roman collection, in the old Castle Museum at Newcastle-on-Tyne, some stone vessels almost identical in size and shape, and which were undoubtedly Roman querns or corn-mills. From the accompanying sketch it will be perceived that the font is semi-globular in form, and stretches thirteen inches across, and is seven inches deep. The stone is of a peculiarly hard nature, and the massive heavy bowl is grooved out of one block. On two sides are handles, cut out of the same stone, with a rude attempt at ornamentation. There are no carvings on it; nor can any figures or initials be deciphered by which its date can be fixed. There was a hole in the centre (now filled up), which would have been necessary for the Roman quern, and equally so for the holy water of the Piscina. How it came into the possession of the aforesaid Mr. Thorne is unknown. He died many years since, and his family, who have been questioned, know nothing about it. He was noted in his day as a frequenter of sales, in order to pick up odds and ends. When he placed this bowl in the church for a font, he is said to have expressed great satisfaction at its having come into such good use. It has been conjectured that it is probably a relic from the St. Nicholas Chapel, on the old Lantern Hill, and held the holy water in some little niche there, in those remote centuries when Ilfracombe was somewhat of an important port, and sent its representatives to Councils of Shipping, and supplied sailors and ships for foreign expeditions (1344). One can picture the brave sailors of those days climbing the rugged hill, and passing and repassing it in the little chapel where they went to pray to their patron saint – St Nicholas – before spreading their sails to breast the waves of the western sea. This theory in no way invalidates the supposition of its having been previously a Roman corn-mill. Wishing for further information, inquiry was made if there was anything like it among the Roman remains in the Blackmore Museum, at Salisbury. Mr. Blackmore, in his reply, said it was unlike any of the Roman quern or corn-mills with which he was acquainted, but a somewhat similar vessel is figured in Isca Silurum, pi. xlvi., fig. 6. The members of the Devonshire Association who saw the font last year were divided in their opinion as to its age. Some thought it only mediaeval. One member suggested whether it might not be a relic of the Ancient Britons – a sacred vessel of the Druids. We know that Devonshire, or Dyvneint (the “land of valleys and brooks”, in their expressive language), was the kingdom of the heroic Prince Arthur, so renowned in story and song, and was the scene of many stirring events. The Britons, driven into the west by the Romans, held sway here for centuries after other parts of the island had succumbed to their powerful conquerors; and the Druids might, in some of their mysterious rites, have used this identical vessel. In any case, it has now found a place of rest, and a haven of peace, after all its wanderings. No doubt there are other stone basins scattered about the county. Surely some record of them should be made. I am informed by Mr. Townsend Hall, of Pilton, that Mr. Chichester, of Hall, has one in his possession. Are there any others known? North Devon is not rich in Roman remains, and it behoves us to make much of what we have. Mention is made, in Rowe’s Perambulation of Dartmoor, of a semi-circular stone, about 18 inches in diameter, with a hole in the centre, found on Dartmoor, and supposed to be a primitive quern or hand-mill. It may be as well to record that another ancient stone bowl was formerly in the possession of a gentleman in Ilfracombe, similar in size, but slightly different in shape, to the one we have been describing. This gentleman, Captain Thorpe, bought it, some ten or twelve years ago for a mere trifle, at the sale of an eccentric old lady living near the quay. It afterwards got broken in some way, but as the gentleman has long since left the neighbourhood its ultimate fate is not known. At the same sale Captain Thorpe also bought an old carved wooden drinking-cup, a supposed holy vessel, which he discovered lying about the yard, and which the quick eye of the connoisseur detected at once. The words “Sacra Vasa” were found carved upon it; and no doubt both it and the stone vessel had formerly belonged to the oratory on Lantern Hill. Ilfracombe has been a rich store-house of treasures for lovers of the quaint and curious. Many rare bits of carving have been picked up in its cottages and among the farmhouses on the coast; and marvellous works of art, of most wonderful device and workmanship, have been discovered in the fisherman’s cabin, or the sea-captain’s best parlour. But nearly all have yielded to the temptation of the visitor’s gold, and little is left to repay the most ardent research. The town was thoroughly ransacked in the late fashionable craze for old china, and despoiled of all it possessed.